This article gives you complete details about the Indian victory and series won against England. Full review of the tournament is given in this article. read the article full for more details. read the article full for complete information. 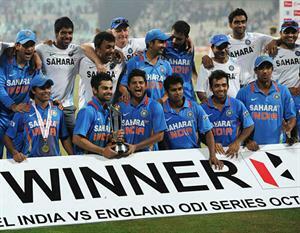 India had successfully won all the matches against England in the One day series against England. India takes the series 5 - 0 against England. Indian spinners showed an amazing performance throughout the series. India also got a new fast bowler named VR Aaron from this series. In the final match he had given an important breakthrough by taking the wicket of Alistair Cook who is going well in the game. Jadeja showed a brilliant performance in the last game by taking 4 important wickets and well supported by Ashwin and Tiwary. While coming to the batting of India, MS Dhoni who again showed his brilliance in the match by scoring more than 70 runs and also hitting some huge sixes in last few over's which made India to reach 271 runs. MS dhoni was awarded Man of the series with his brilliant batting throughout the series and Ravindra Jadeja was awarded the Man of the match Award in the final match of the series. Jadeja is the highest wicket taker of the tournament with 11 wickets from 5 matches. Most centuries in the tournament: Virat Kohli with 1 century. players no exposure to wet weather conditions.English players exploited their home conditions betterthe team is a well knit young side that had just begun to perform as a unit. Returning from a tour sans a victory India needs to be complemented for the 5-0 white wash they the English lions.They were not perturbed by the recent results but played positive cricket to reverse the fortunes.Youngsters like Raina, Kohli,vinay kumar, R jadeja,a RAHANE performed really well where as Manoj tiwari ,Varun aaron were the finds of the series.Good luck India keep it up.